Heritage Waukesha is putting together Christmas care packages and making Christmas cards for our brave servicemen and women. To join our care package team, RSVP to act13@heritageal.com by October 31. The public is invited to donate care package items, including: Boxes of stuffing, wet wipes, Little Debbies/Nutty Bars, canned meat, Chapstick with sunscreen, gum, granola bars, cans of soup, toothbrushes, deodorant, cookies/crackers, books/magazines, hand warmers, tampons/pads, hair ties, small Kleenex packs, hand sanitizer, instant coffee/hot chocolate, warm socks, popped popcorn, Icy Hot pads, small jars of peanut butter and old DVD/game systems and DVDs. 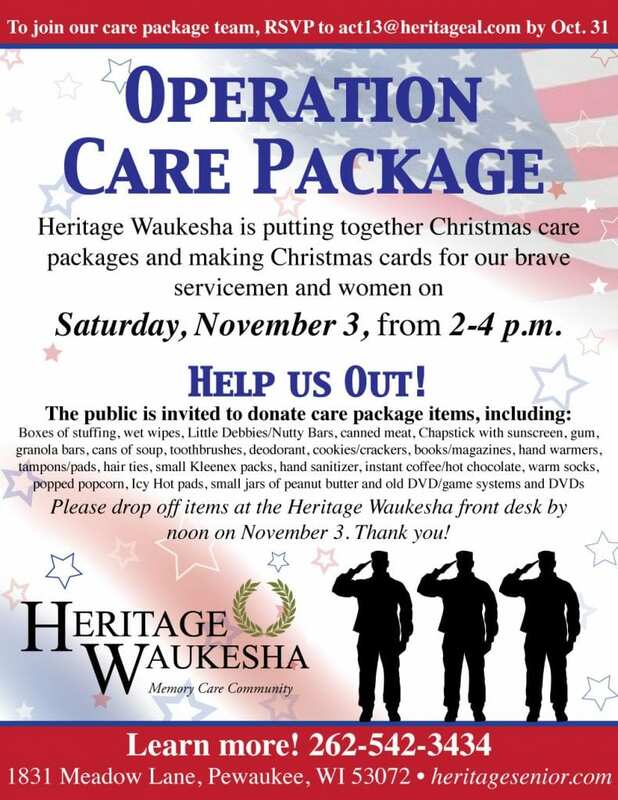 Please drop off items at the Heritage Waukesha front desk by noon on November 3. Thank you!